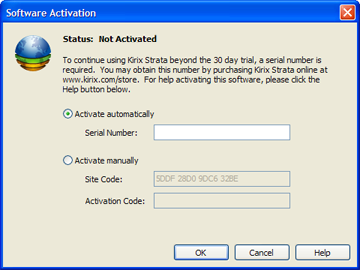 After you purchase a Kirix Strata license from the online store, you will receive a serial number, which is used to activate and unlock the software. To activate the software, first select Activate from the Help menu. The Activation Manager will appear and offers two ways to activate your license, either automatically or manually. Activate Automatically: This is the simplest way to activate and is recommended for most customers. Simply enter your serial code and your license will be authenticated over the Internet. Activate Manually: This method involves a few extra steps and is useful if a corporate firewall prevents authentication over the Internet. To activate automatically, simply enter your serial number into the first box. We recommend that you copy and paste the serial number directly from your email in order to prevent a typographical error. Once your serial number is entered, click the OK button. The software will authenticate with our license server over the Internet and unlock the software. Sometimes automatic activation is not possible. This is usually caused by restrictions set up by corporate firewalls. If you find yourself in this situation, you can still activate your license using a manually-generated Activation Code. 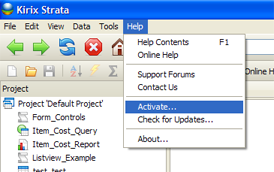 To begin manual activation, select the second radio button entitled "Activate Manually." You will see that a Site Code appears in the first box. The Activation Code remains empty. You now need to generate an Activation Code manually. To do so, log in to your Kirix Account with the same login and password set up when you made your purchase. After logging in to your Account, select Generate Activation Code from the right-navigation menu. In step #1, enter your Serial Number that you received (by email) after your purchase. 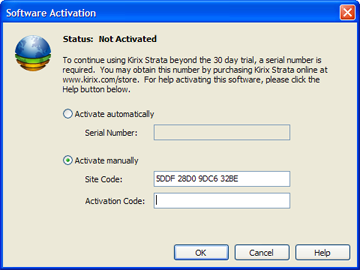 In the second box under step #2, enter the Site Code found in the Activation Manager in the software. Finally, click the Generate Code button in step #3. You will see that an Activation Code has been generated for you under step #4. 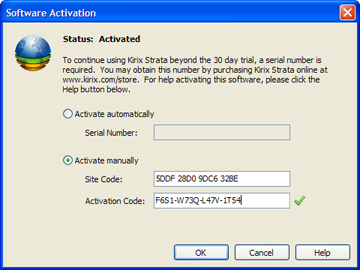 Copy this code and paste it back into the Kirix Strata Activation Manager. If everything was done correctly, a small green checkmark will appear next to the Activation code signalling that the code has been verified. Click the OK button to finish the activation and unlock the software.